The GOP instigator in chief tried to get Marth McSally and the Arizona Republican Party to go on a warpath against a possible Democratic win for the Senate seat being vacated by retiring Republican Jeff Flake. Trump freaked out that voters happened to have been still coming in days after election night - really, the fact that more of those votes seemed to have been coming from areas the Democrat, Kyrsten Sinema, was winning. As Sinema’s lead grew and grew, McSally pulled a class act rare among the GOP: she accepted the verdict of the people of Arizona, and conceded the race. 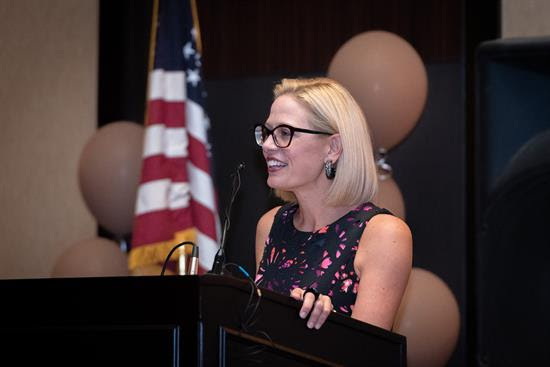 Kyrsten Sinema won’t just be the first Democrat Arizonans have sent to the Senate in three decades. She will also be the first openly bisexual member of the US Senate. Sinema’s victory does not seem to have been a one-off, however. Democrat Katie Hobbs is now leading in the race to become Arizona’s next Secretary of State by a razor thin margin of 5,667 votes, and Democrat Kathy Hoffman is leading the race for Superintendent of Public Education by a healthy 2.5 points. Given that Arizona has a total of 4 statewide Constitutional offices (the aforementioned two as well as Governor and Attorney General), Democrats will have won three of the five statewide races in Arizona this year, including the Senate seat, if these trends hold. Democrats flipped one House seat in Arizona, and now a majority of the Congressional delegation from the state are Democrats. That is a political earthquake. Before this year’s election, every one of Arizona’s statewide constitutional offices, as well as its US Senate seats - six out of six statewide elected position - were occupied by Republicans. In the race for president in Arizona in 2016, Trump beat Clinton narrowly (3.5 points) by running up the score among white, male and older voters. Republicans did not lose ground among white voters in Arizona this year. This year, like in 2016, white voters made up 75% of the electorate, and McSally claimed 53% of that vote, similar to Trump’s 54% in 2016. The real difference came down to the state’s Latino voters. Two years ago, Hispanics made up 15% of the electorate and voted for Clinton by a staggering 30 points, 61% to Trump’s 31%. Latino voters made up 18% of the electorate this year and chose Sinema by a bigger margin, 70-30. Overall, non-white voters made up just a quarter of the electorate in both elections, but Democrats won them by 37 points this year, compared to 27 points in 2016. This is a massive Demographic shift in the age of Trump, and the Republican party is nowhere near a recovery among non-white voters. Democrats did not win the Senate election in Texas, but the story of the demographic shift is the same. The white vote in Texas is much more heavily racist, I mean Republican (66% of Texas white voters cast ballots for the GOP), but non-white voters are quickly approaching half of the Texas electorate, and the share of Latino vote is rapidly rising (up to 26% this year from 24% in 2016). With Democrats outperforming Republicans among non-whites by a slightly better margin that Republicans outperform Democrats in Texas among whites, Ted Cruz’s frighteningly thin margin of victory is entirely a function of whites holding a 56-44 majority among the electorate. Nevada, a close state that went for Clinton in 2012 also saw a shift into the deeper blue column last week. The Nevada electorate has a near-identical racial divide to Texas, and while its white electorate is more closely divided (57% Republican), its non-white vote is as strongly Democratic as that of Texas (two-thirds), which resulted in a 5-point Democratic victory this year compared to a 2.5 point victory for Clinton. The most impressive of the performances, though, may be that of Stacey Abrams in Georgia. She’s outperformed Clinton among black voters and white voters, and she is damn close to forcing a runoff. In another ripple from the blue wave, come January, the Georgia House seat that was once soiled by Newt Gingrich will be held by a Mother of the Movement, Lucy McBath. All these states - Arizona, Nevada, Texas and Georgia - are seeing the kind of demographic electorate shifts (in intensity or in numbers) that are usually achieved over a few presidential cycles in the space between just one presidential and one midterm elections. Think about this: all of a sudden, three “red” states are in play for 2020, with Arizona being the most likely pickup for the Democratic nominee. Pair that with the restoration of even part of the blue wall in the northern border states of Michigan, Pennsylvania, Ohio and Wisconsin, and Trump’s path back to the White House is forever, shall we say, walled off. Michigan and Pennsylvania turned several shades of blue in their gubernatorial races last week, with Wisconsin ousting Scott Walker and Ohio - the least likely of Trump states to go Democratic in 2020 - sending Sherrod Brown back to the Senate. There’s reason one Republicans should be freaking the hell out after what happened in Arizona, Nevada, Texas and Georgia. Reason two: a reorientation of the electoral map for the long term. It is my observation that states that move away from red and into the purple and eventually into the blue due to demographic shifts more reliably stay in the Democratic column than, say, Ohio, Wisconsin and Pennsylvania. In the long run if Texas and Arizona go reliably blue, Democrats won’t even need the WI-PA-MI blue wall to forever hold on to the presidency. People often forget that California was a reliably Republican state in the presidential elections until the 1990s, and the gubernatorial transition from Jerry Brown to Gavin Newsom will be the first same-party hand-off in over 100 years. California’s reliable blue shade in the presidential elections is the result of a major demographic shift and of the anti-immigrant policies that made that shift politically active. In other words, there is good cause for Donald Trump and Republicans to be losing their marbles. They might soon have to face a purpling of the south and the west driven by demographic trends and no longer susceptible to “white working class” mumbo jumbo of campaign rhetoric. The freakout, then, is not about losing the House. It’s about what this election proved - that demographics are, sooner or later, destiny. This shift won’t hold unless the coalition we saw rising this election across the country continues to galvanize and vote. Donald Trump’s ginning up of white nationalism, racism and xenophobia will only intensify over the next two years as he tries to stay out of jail by staying in office.